This quick and tasty chili recipe is a family favorite on a cold winter’s day. It’s also the recipe that my hero in Deep Cover makes for the heroine’s young sister. Brown onion and ground beef in the bottom of a large pot. Pour off excess fat. Stir in all the other ingredients and simmer for 20 minutes. Serve over mashed potatoes or with tea biscuits. Skin tomatoes using boiling water. Mash tomatoes and chop all ingredients. Combine in pot with spices and vinegar. Simmer 1-2 hours. Put in sterilized jars and seal with heated lids. You can get this book free with my special coupon code. The book retails for $2.99, but use the special coupon code, SandraOrchard, to download the book for free!! The receipt will appear in your inbox almost immediately, but I found that the email with the download link was delayed by a couple of hours. Rest assured that it will come. You may want to check your spam file if you don’t see it after a few hours. The book itself is a 55.6 MB color pdf file so if you’re not on highspeed, it could take a while to download. 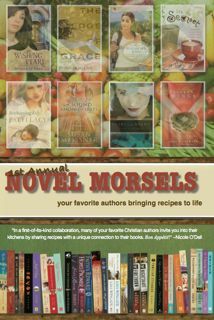 Novel Morsels is also available for 99 cents on Kindle and Nook with limited pictures due to file size. Did you know that you can download free software called Calibre that will convert pdf files to files better suited to your particular Ereader? I use it to convert my pdf files to mobi files for Kindle, and it works great. 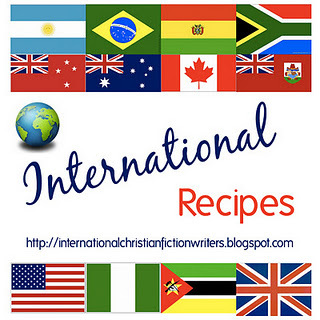 Written by authors of Christian fiction representing a variety of rich cultural traditions from Canada to the UK to Tasmania to Brazil to Mozambique, its goal is to promote international Christian fiction. Travel with us around the world as we sample delicacies that uniquely represent our home countries or the settings of our books. • Mennonite stew from Canada. And many more! Over 40 recipes in all. You can choose from a variety of formats that can be read online or on popular Ereaders, or as a pdf for printing.